Kick-off your shoes and lay back. These thick woven cotton hammocks are great for relaxing, napping, and sleeping on a summer day. You can hang them in your backyard, or take them to your favorite campsite. As you are snoozing, you can rest assured that your purchase has the additional benefit of helping artisans care for themsleves and their families. These hammocks comfortably support 242 lbs. 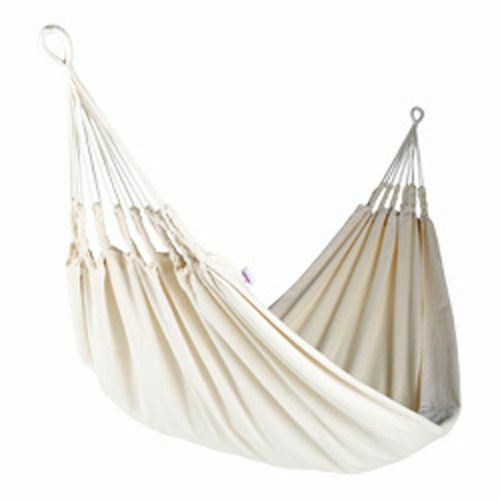 Classic - Large White Hammock made from 100% cotton. The cloth measures 55" wide x 94" long, and the length can be stretched up to 11.5 feet. Love and Neon Glitter colors - are woven from 80% cotton and 20% acrylic. These are a little smaller for to accomodate those tight spaces; the cloth measures 47" wide x 87" long, and the length can be stretched up to 10.75 feet. Woven and Hand-finished in Ecuador and Fair Trade imported.